Haria is a small but beautiful village in the north of Lanzarote, with a population barely over 1000 people. Haria is situated in the valley with the same name, also known as The Valley of The 1000 Palms. The legend says that in the past families used to plant a new palm tree each time a child was born - one palm tree if a girl was born and two palm trees for each boy. In time the valley of Haria became the greenest part of Lanzarote and is now known as the valley of the 1000 palms. Haria Valley was formed as a consequence of the eruption of the 3 volcanoes that surround it: La Atalaya, Los Helechos and La Corona volcano. Due to the eruptions the ravines of Elvira Sanchez and Tenesia became interconnected and the Haria valley was formed. This area is the most fertile place in Lanzarote, due to the rainfalls which are more frequent than in the rest of the island. 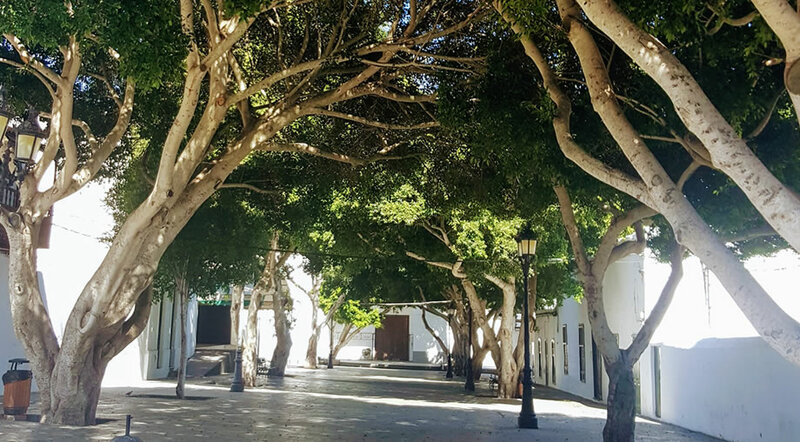 Also, due to its location and the fact that it is surrounded by volcanoes, Haria is sheltered from winds and is one of the most humid areas in Lanzarote. A beautiful shaded plaza, with bars and cafes where you can enjoy a few moments of rest. It is a very pleasant place, where you can see old restored houses with an architecture specific to the island. At the end of the plaza you will find the church of Nuestra Senora de la Encarnacion with a small art museum inside. The famous Cesar Manrique used to love the village of Haria and he lived here during the last year of his life. As a matter of fact, he is buried in the local cemetery. You can visit the house where Cesar Manrique lived, which was opened as a museum in 2013. You can buy a combined ticket for the House Museum in Haria and Cesar Manrique Foundation in Tahiche for 15 Euros. Although not as large as the famous Teguise Market on Sundays, the Market in Haria is full of handmade souvenirs and objects. You can spend a few relaxing hours here just browsing through the stalls and then enjoying something to drink and eat at one of the local cafes. Since the area has a very special location in Lanzarote surrounded by volcanoes and beautiful views, there are a lot of trails and hikes that you can do. The most popular is the hike to Mirador de Haria, which will take around 90 minutes and will offer spectacular views over the village and also the nearby villages of Arrieta and Tabayesco. This is a very easy walk if you have comfortable shoes. Remember to bring snacks and water when you go hiking and avoid the middle of the day time, when it's very hot outside. Also, from Haria it is very close and easy to get to Mirador del Rio, the most famous viewpoint in Lanzarote. From that platform you will see the neighbor island of La Graciosa.